An upcoming Season 21 Simpsons episode will focus on the sport of curling. In the episode (probably titled Rednecks and Broomsticks, though unconfirmed), Homer and Marge form a mixed-doubles curling team with Principal Skinner and his mother, Agnes. Marge turns out to be a good curler because of her expertise at household chores, while Homer is not very good. Marge must decide whether to risk hurting Homer's feelings by dropping him from the team. Meanwhile, Lisa sets out to collect Olympic pins. The episode is set to air in February, just before the 2010 Winter Olympics. That's right, Futurama has been resurrected once more! Comedy Central has announced they have picked up the series for an impressive 26 new episodes. Futurama was cancelled in 2003 after the fifth series. However it was revived in 2007 in the form of four straight-to-DVD movies, the last of which released earlier this year. Comedy Central will begin showing the new instalments in mid-2010. Quipped Matt Groening, "We're thrilled Futurama is coming back. We now have only 25,766 episodes to make before we catch up with Bender and Fry in the year 3000." Added David X. Cohen, "We're excited and amazed that the show is coming back, perhaps due to some sort of mysterious time loop. We look forward to working with Comedy Central and 20th Television to make this the best iteration of the loop yet!" Civic officials at two Scottish cities are fighting over the home town of Simpsons character Groundskeeper Willie. Both Glasgow and Aberdeen believe he hails from their city. Glasgow City Council have put Willie in their online hall of fame alongside the likes of Billy Connolly and Lulu. In the Season 8 episode, Simpson-califragilisticexpiala (Annoyed Grunt) cious, Willie reminisces about Shary Bobbins: Then she got her eyesight back. Suddenly the ugliest man in Glasgow wasn't good enough for her! However, in the Season 14 episode, 'Scuse Me While I Miss the Sky, Willie wakes from a nap shouting Go Aberdeen! But of course, any Simpsons fan will tell you that Groundskeeper Willie actually hails from North Kiltown! We've got something very special for you today! We've gathered the best impressionists we could find to bring you a Simpsons fan-recording. Basically, it's a fan script acted out in the Simpsons voices by our impressionists. None of the voices are perfect, but a couple are excellent. The recording quality also varies a bit, but we hope to work on this for future shows. Big thanks go to Poll aka OKC who has run the whole project, and chosen Simpson Crazy to host this file; and of course to the impressionists and everyone else involved in the show. Please let us know what you think!! Firstly, the DVD guide has been expanded and updated. It nows lists all the special features on the DVDs as well. More Easter Eggs have been discovered: I'm confident that we've got them all listed now, and a couple more animations were discovered. The guide is available from the Information page. Furthermore, many new images have been added to the special gallery. It's too much trouble to list them here, but they're all marked on the page. 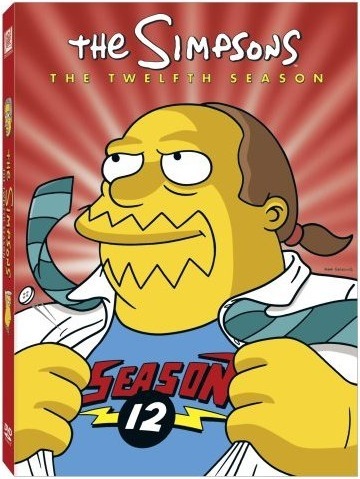 Yet more in-depth information pages have been added to our growing library: a guide to the Simpsons "Complete Season" DVDs. The Simpsons is a fun show, and the DVDs reflect this with lots of special features, cool animated menus and even hidden bonus material, more commonly known as "Easter Eggs". I also added another entry to the recycled animation page. Other lists also need updating (such as the song lyrics) - I will try to get them done asap. Frink out. I've got a huge update for you today! 14 more Tracey Ullman shorts have been added to the downloads section! See Homer try to take a family photo, Bart take an interest in art (! ), the first appearance of Grampa and more! Definitely worth watching. First content update for a little while, but it's a good one. I finally got around to updating the contests. The previous answers were: Simple Simpson and L.T. Smash (from New Kids On The Blecch). A new Secret Sound and Which Character contest can be found on the Interactive page. I also added a new wallpaper of Homer and Bender from Futurama at Moe's! Go to the Wallpaper page to download. Our miscellaneous pictures section has been updated today, with several new Channel Four mosaics, and a whole bunch of very cool Halloween art from Simpsons Comics. Furthermore, four new Butterfinger adverts have been added to the Videos page. They're pretty funny so check them out! Sky One's A-Z of The Simpsons! Throughout December, UK television channel Sky One are running a new promotion, "The Simpsons A-Z". Every day for 25 days, episodes are shown which highlight a representation for the day's letter (with Y and Z together on one day). A is for Apu, B is for Bart, C is for Couch Gags, and so on. Each letter's alias also comes with a clip compilation, highlighting the best of that character or situation. The promotion started last Monday and we are already up to the letter H (for Homer). I have archived the definitions and corresponding episodes into one page, which can be found in the articles section of the info page, or by clicking here. I also added a new promo card I found for the Season 6 episode, "Itchy & Scratchy Land". Ho ho ho! Merry Everyone! The holidays are coming! And to celebrate, we've put up a nice Seasonal design, hope you like it! And to brighten up your desktop, we've got five great Christmas-themed wallpapers!